Another small ecotourism attraction in Halkidiki is Agios Mamas (Saint Mamas) wetlands, just after Potidea canal that occupies an area of 6.332 acres. 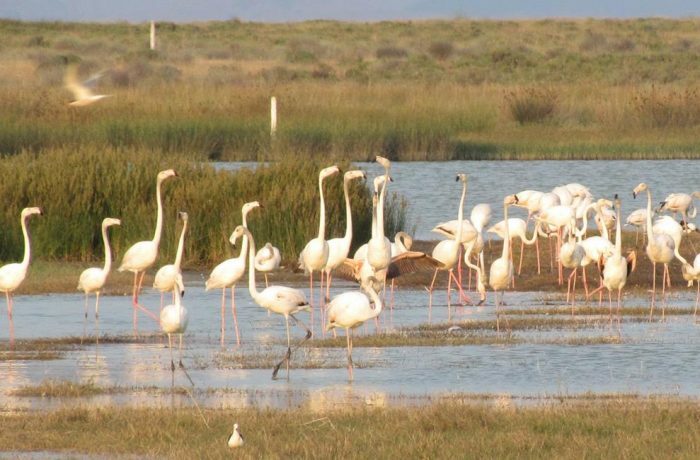 Agios Mamas march is a small coastal wetland, located between Kassandra and Sithonia peninsula, an important location for breeding and passage waders. The wetland with the standing water has sand-dunes and reedbeds. Many species of birds live here. Two of them, for which the area is protected are collared pratincole and Black-winged Stilt. These species are reproduced here every summer. In winter you can see the impressive flamingos, which live there till spring. In Agios Mamas marsh there are also other species, such as predatory species of birds, ducks etc. Many of the species are migratory and protected directly or indirectly by international conventions (eg Ramsar, Bern, Rio) and European Directives (p.ch.79 / 409 / EEC on wild birds). Also, many wetlands are protected by national legislation, the Ramsar Convention and included in the European network of protected areas.